There are just over 6.3 million Israeli voters on the electoral roll for the 21st Knesset elections. Of these, some 950,000 (15%) are Arab citizens. A recent public opinion poll among Israeli Arab voters, conducted three weeks before Election Day by the German Konrad Adenauer Stiftung and the Moshe Dayan Center for Middle Eastern and African Studies at Tel Aviv University, found that in the upcoming elections, voter turnout among Arab citizens is expected to reach a low of 51%. If this indeed occurs, it will signify a return to the average level of voter turnout in the Arab sector during the decade that preceded the formation of the Joint List prior to the 2015 Knesset Elections. In four election campaigns between 2006 and 2013, voter turnout in the Arab sector hovered around 55%, while in 2015 it reached a relative peak of 64%. In the 2015 elections, voter turnout reached 64% following the establishment of the Joint List as a united political framework for the four main parties representing the Arab voters in the Knesset: Hadash, Balad, The Islamic Movement and Ta’al (Arab Movement for Change). But, by contrast, it was much lower than the national turnout (64% and 72%, respectively). Still, the Joint List won 13 seats in the Knesset, the largest number of seats that the main parties representing Arab citizens had ever won in total. This was mainly because 80% of the Arab voters supported the Joint List while only 20% voted for Jewish-Zionist parties. The major reason for the low Arab vote for Jewish-Zionist parties is the Arab public’s growing disappointment from state authorities during the past two decades. The rift between the Arab public and state authorities became clear in the wake of the October 2000 Events, when 13 young Arab citizens were killed by Israeli police forces in violent demonstrations which took place in Arab localities following the outbreak of the Second Palestinian Intifada in the West Bank. 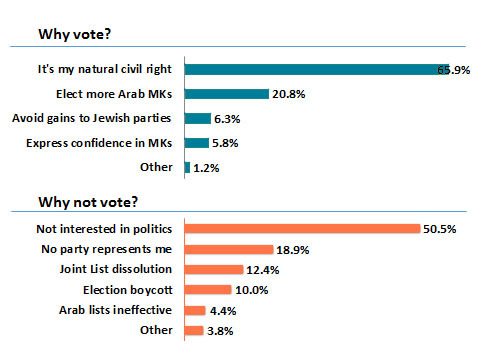 With just a few days before the elections for the 21st Knesset, the mood in the Arab public can be best described as “political indifference.” Half of the respondents (51%), who said they do not intend to vote in the elections, or were unsure, simply explained their decision by stating that they have "no interest in politics." Others claimed that no list represented them (19%) or were disappointed with the dissolution of the Joint List (12%). Only 10% said they would boycott the elections for ideological reasons based on the opposition to Arabs voting for the Knesset, the supreme representative institution of the Jewish state. In contrast, most of those who intend to vote (66%) explained this by exercising their natural right as citizens, or by enabling as many Arab representatives as possible to enter the Knesset (21%). According to the survey, most of the abstainers are actually young people up to the age of 35: 52% of them said they do not intend to vote in the upcoming elections, or are uncertain. In contrast, a majority (65%) of respondents over the age of 35 intend to vote in the elections. What is behind this phenomenon? One reason is related to government policies and Knesset legislative initiatives that emphasize the Jewish-Zionist character of the state. In July 2018, the Knesset passed the Nation-State Law which determined that the right to self-determination in the State of Israel is exclusive to the Jewish people. The law stated that the Arabic language would have a "special status", thus downgrading its status from an official language in the country, a status enjoyed by the Hebrew language. Therefore, many Arab citizens feel that their ability to influence the course of life in the country is diminishing. Even the hypothetical hope to repeal or change the Nation-State Law by means of counter-legislation in the Knesset does not encourage Arab voters to participate in the elections. Many of them realize that the chances for such imitative are slim in light of the dominance of the Jewish right-wing parties in the Israeli parliament. Another reason is related to the internal rivalries between the Arab members of Knesset, which paradoxically became more acute after the establishment of the Joint List. Three months before Election Day, Ta'al, headed by Ahmed Tibi, withdrew from the Joint List, leading to its eventual dissolution. Many in the Arab public realized that the desired vision of Arab unity became an illusion and collapsed. The four Arab parties that formed the Joint List regrouped into two small political alliances to compete in the elections: Hadash with Ta'al and Ra'am with Balad. But even if they pass the threshold and gain representation in the next Knesset – Hadash-Ta’al with 6-7 seats and Ra’am-Balad with 4-5 seats, according to the aforementioned survey – the public does not view the split favorably. 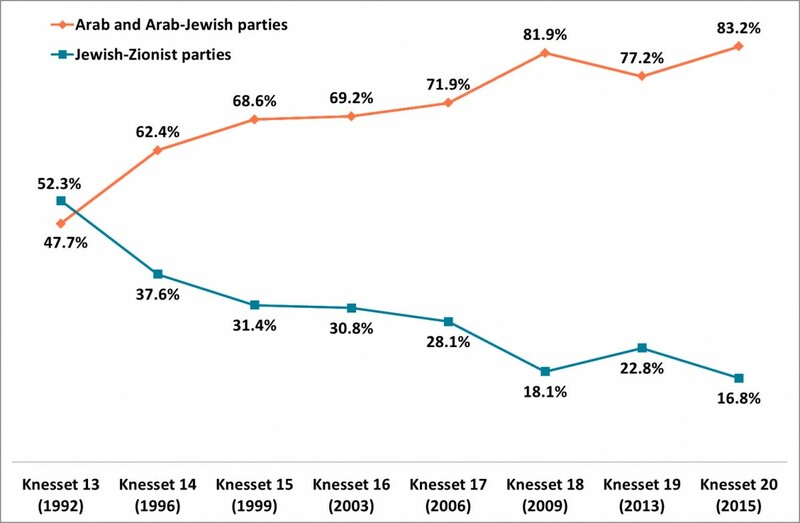 Nearly 60% of the Arab public believe that the political efficiency of the Arab factions in the next Knesset will be reduced due to lack of coordination between them. Only 32% believe that the split of the Joint List into two independent Arab alliances will allow these alliances greater freedom of action in the upcoming Knesset. The Arab public is more concerned with local problems related to its daily life within the State of Israel than with issues related to the Palestinian problem in general. At the top of its political agenda, according to the aforementioned survey, are issues such as the eradication of violence and crime in Arab society (26.8%), legalization of structures defined as "illegal" due to planning and construction shortage in the Arab localities (21.7%), struggle to repeal or amend the Nation State Law (19.6%), and improvement of the relations between Arab and Jewish citizens (15.7%). The connection with the Palestinian Authority is much less important (3.6%). Table 1: What's on the Arab Political Agenda in Israel? The Arab voters will give their vote only to those who can deliver the goods: to improve their economic situation and their status as citizens of the country in which they live. 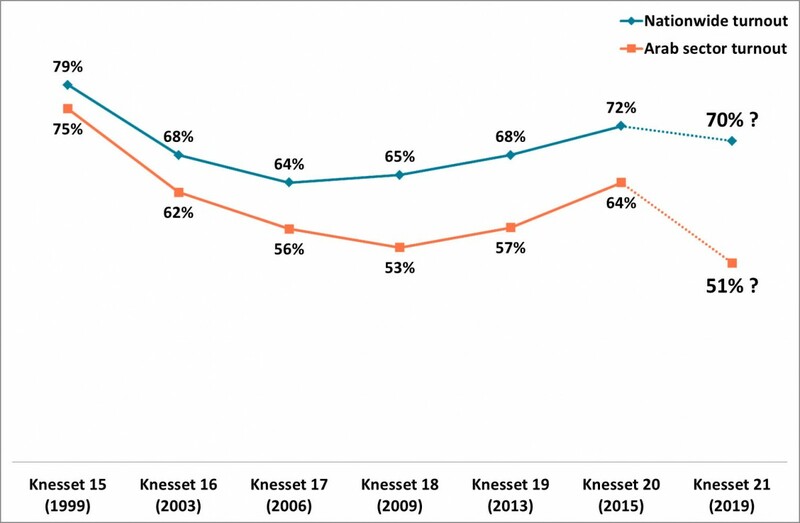 Despite the criticism of the laws approved by the Knesset, it turns out that a large majority of the Arab public (almost 76%) is convinced that the Knesset is still a relevant political arena for the Arab public and that they should not give up on it. It remains to be seen in the near future whether Arab parties and state institutions will adopt a constructive discourse in order to encourage the participation of Arab citizens in the elections, and to convince them that they too have an effective political influence within the Israeli society and political system.